Exclusively available to our members, our rewards program gives access to member-only unique offerings and experiences. You will earn one reward point for each dollar spent on wine. Once you earn 500 points you can redeem for either of our first reward offerings or continue to save points for an exclusive winery experience. Points do not expire while you are an active member. Membership Rewards Fine Print Since we can't give away wine for free some offerings must be purchased for $1. Double discount is available on up to one case of wine. Not applicable to merchandise, tasting fees or event tickets. Complimentary ground shipping available on up to one case of wine. Points are not transferable. Member must be present to redeem experiences. Points are forfeited upon cancellation of membership. Advanced reservations required for reward experiences. 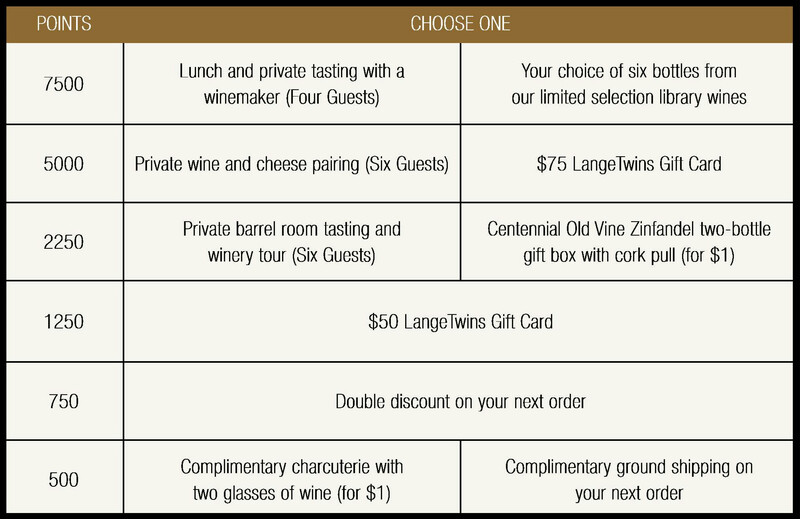 Please call 209.334.9780 or email hospitality@langetwins.com to book your experience.